Numbers. It’s what we seek. It’s the basis behind a lot of what is asked when someone states a “fact.” It’s data. It’s statistics. It’s also a count of HUMAN LIVES. In 336 days, there have been 355 mass shootings across the country. At the time of the writing of this article, 462 lives have been lost and 1,313 people have been injured. Where do these numbers come from? Is it the left-leaning “liberals” concocting schemes calling for gun control? No, these numbers come from crowd-sourced information with sources for each incident found through Mass Shooting Tracker. In the hours since the San Bernadino shootings, my Facebook newsfeed is being filled up with numbers. Sure, my friends list tends to lean left – but these are factual numbers. 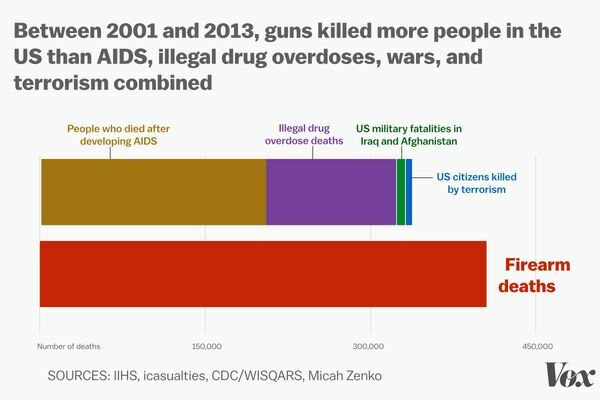 For example, guns have killed more Americans in 12 years than AIDS, war, and illegal drug overdoses, COMBINED! We are a mere 11 days away from the three year anniversary of the Newtown massacre at Sandy Hook Elementary School that claimed 26 lives, the deadliest slaughter of innocent lives in our recent history. The San Bernardino massacre is the next deadliest mass shooting since. Hell, it’s the 13th mass public shooting this week alone. How many more numbers do we need to make us take serious action? Where are those in positions of power? Why aren’t they crying out for a stop to these daily horrific acts of domestic terror? Prayers alone won’t cut it. But these folks are in positions of authority because we voted them into office. WE need to be calling on elected officials to address these acts of terror head on! Yes, we will grieve for the countless lives lost due to gun violence. But if we do not stand up for what is right and expect and demand our elected officials to take action – we are simply being complacent. And if you believe in social justice, you should believe in the value of human lives. And to show that we do value the lives of these 462 victims and 1,313 injured humans – we must act to honor them. And before the naysayers counter my sentiments, please do not tell me that more guns equal safer communities. This is not true. There is no evidence backing this statement. Having more armed citizens does not directly correlate with the prevention of mass shootings. In fact, a study recently found that people with access to guns are actually at higher risk for suicide and homicide. Another study from 2009 found that people who owned guns or had access to them were 4.5 times more likely to be shot than those that did not carry. Carrying weapons does not make for safer spaces. The October 2015 tragedy at Umpqua Community College took place in a state that allows for the licensed carry of concealed handguns. Oregon is one of seven states that allows the carrying of concealed weapons on campuses, according to the National Conference of State Legislatures. And while this is actually legal in Oregon – that did not stop the terrorism that took place that resulted in the loss of 10 lives. Enough with the heartbreaking hashtags. Let’s stand up and take action. Our children deserve to go to school without fear of being hurt. Human service workers deserve to go to work helping poverty impacted communities without fear of being gunned down. We deserve to go to the movies to enjoy ourselves – not to be slaughtered. It’s never too soon to speak about gun control. It’s never too soon to do something about it. Enough is enough – let’s stand together and take action.